In my schooldays I had a friend who loved playing bongo drum. His father was my math tutor, and the old man, an ex-college professor who taught with flair, was unhappy that his son won’t study, and would only play the drum which he loaned from a neighbor. Our house was close by, and while I studied my math and history to score good marks in exams, I could see my friend, 3 houses away, near the window, bent on the bongo drum, practicing endlessly with his nimble fingers. Long story short, he became quite famous even before I completed my college. He was already earning handsomely before I landed a job. He toured many places, met many more people, and of course enjoyed life like he should. Years later when I met him in a downtown pub, my only question was, did he practice the drums like the old days? Guess what, he still did. History is replete with stories of astounding success makers. In September 2013 swimmer Diana Nyad became the first person to swim from Havana, Cuba to Key West, Florida without the aid of a shark cage. She did it aged 64. Behind this remarkable feat was a single-minded pursuit of her dreams since 2010. After 4 failed attempts Diana in her fifth attempt swam the 110 miles’ distance in 53 hours to make history. Reading up to this point you may wonder that perhaps only hard work is the sure path to success. 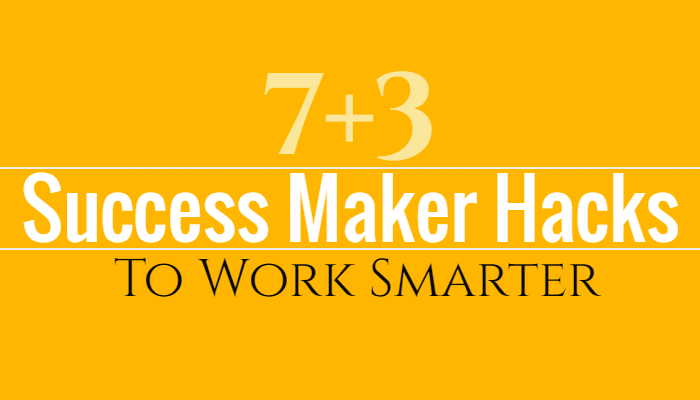 Curiously many people feel that the trick to be successful is to work smarter not harder. Fortunately, there are many great tips available on the web. One of those I personally like is the collection of 17 tips to work smarter by Eric Barter. Eric Barker offers 17 great tips, and he confirms the list is so good that everyone would benefit from it. 1. Carry a notebook and pen. Sparkling ideas don’t wait. They need to be jotted down before they vanish, sometimes forever. It so happens that great people strongly feel that learning is the only way to perform better at every stage. 3. Failing is OK. Not failing is not OK.
Einstein famously said – Anyone who has never made a mistake has never tried anything new. So failing is OK. Not failing is not OK.
Never say up front that you can beat a deadline. You’ll agree it is much better to underpromise, and overdeliver than the other way round. Get used to the three “-ty’s.” Ambiguity, uncertainty, volatility. That’s how it works on ground no matter what. Respond to calls and emails quickly. Remember you are working ‘smarter’. 7. Make a “To Don’t” list. This is a clincher. What this suggests is, prepare a list that contains all the things you shouldn’t waste your time on, then place it next to your “to do” list – and stick to it. 8. Establish an opening ritual. Try to begin your day the same way. An opening ritual, more than anything, eases your mind, body and soul into the day. 9. Be quick. But don’t hurry. This one comes from a legendary basketball coach. Read it again. Think about it. Makes sense, eh? 10. Silence. Work in progress. Working smart doesn’t take away the sheen off hard work. My friend’s drums made sound but he practiced in solitude, stretching for hours, every day, day after day. Watching him then, and thinking of it now, it becomes apparent to me that it’s when the mind and the body work in unison, the road to success opens up. So…what is your success mantra in life? Give your take in the comments below.